I think I will consider my birthday this year to have officially started on the morning of Friday, March 4th, when my sister-in-law Kim (who lives in China, where at the time it was indeed March 5th--12:18 AM to be precise) wished me a happy birthday on my Facebook wall. Earlier in the week, Dave Kellett, the comic artist behind Sheldon and Drive, had posted to his feeds that he was going to be at Emerald City ComiCon this weekend. I had half-seriously thought about going on Saturday, but then Elizabeth scheduled my birthday party Saturday afternoon and evening, and I had already made morning plans, so I had decided not to go. Until, that is, free lunch Friday. Every other Friday, which is the day after payday at work, my team goes out for a free lunch. Free, that is, to everyone but the person whose turn it is to pick the restaurant. On this particular Friday, it was Josh's turn, and we went to Jimmy Mac's in Renton. Jimmy Mac's has amazing bread, among other things. Somehow or other it came out that one of my co-workers, Andrew, was planning on leaving for ComiCon in the afternoon, whereat he would attend "The Hour of Awesomeness with Wil Wheaton" and get a photo with him as well. Wouldn't it be great, he suggested, if I (who look uncannily like Wil Wheaton) would come along and get a photo with my slightly shorter doppelganger? Josh, who is ever the instigator, and also a fan of Dave Kellett, decided to throw his support behind the plan. Entirely aside from our visigial similarities, I have come to appreciate Wil Wheaton. His championship of the gamer geek ethos, his antics, his blog, and his contributions to The Guild and The Big Bang Theory have made me a fan. I was therefore easily persuaded, but there were some logistical details to work out. In the car on the way back to work, I gave Elizabeth a call. Yes of course she totally wanted to come, and she would check with her mom about taking Shoshana while we were there. She would bring the camera and the shirt I had made last Halloween [reference]. Thankfully my work schedule is flexible enough that I can usually leave 5 hours earlier than planned on a whim. At 2:00 PM we left for the convention. I had never been to a "con" as they say, and so I had a few preconceived ideas, but in general didn't know what to expect. The first thing we did after meeting up with Andrew's girlfriend, buying tickets, and entering the convention hall, was head for Dave Kellett's booth. Dave had kindly provided his fans with a map showing his "impossible to miss" location on the show floor. It was indeed easy to find, and Mr. Kellett was perfectly personable and helpful. Liz and I bought the first Sheldon book, and Josh bought the fourth (since, I believe, he has the first three). He drew Flaco (the lizard) in our book, and Arthur (the duck) in Josh's book. After that, we wondered the floor for a bit. We each entered a drawing entitling us to a free superhero pin--I picked Wolverine. There were a couple other artists I recognized, but none I was interested in interacting with at that point, so after making a lazy circuit, we headed back out and found the place where Wil Wheaton's Awesome Hour was to take place. We were about half an hour early, but still the center section was occupied pretty far back. We settled into a row of seats in a side section near one of the microphones they had set up for questions. In short, the Hour was indeed awesome. Wil Wheaton, in his entertaining style, told stories about video games, growing up, his family, and life. The last fifteen minutes or so were dedicated to questions. A few people asked him to answer "as Evil Wil Wheaton", which, he did (though usually in brief, as he was on the spot, and I imagine it's difficult for him to get into an "evil" mindset amidst thousands of adoring fans. One kid (about 10 years old) asked what "he" would do if Sheldon Cooper showed up. He said he would get right in his face, just to make sure he had made his bed in "his house" (referring to a comment that Evil Wil Wheaton had made on BBT, that he was living rent free in Sheldon's head.) I was sitting at the end of the isle about three feet away from the kid, wearing my replica of Wil Wheaton's recursive shirt. I was quite tempted to surprise the kid by getting in his face on my knees as Evil Wil Wheaton, but he had already started to walk away. When he had left the stage, I decided it would be fun to get some pictures of me behind the podium, so I did. As I stepped down, a rather gruff looking heavyset man addressed me, asking whether I still keep in touch with the actors from Stand By Me. I had never actually heard of Stand By Me, so I was at first a bit dumbfounded. "No," I said, "but then, I'm not Wil Wheaton." It took him a few seconds to register what I had said, and afterwards, I'm not entirely sure he believed me. I had, after all, just alighted from the very stage he had occupied for the last hour, and he had quite possibly just made his way to this spot upon the conclusion of Wil's remarks. 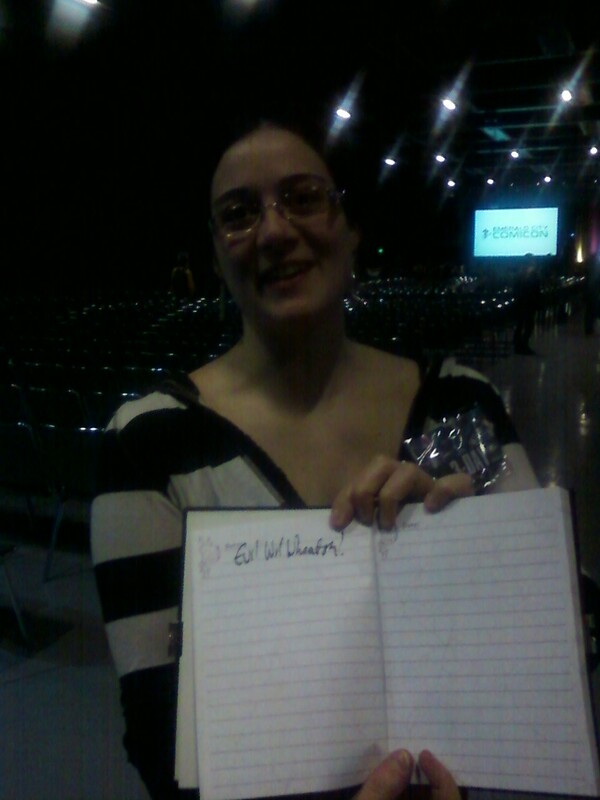 After the Awesome Hour, we all headed to Wil Wheaton's "line". On the way, I learned about Stand By Me. Upon arriving, I was told that they had been chanting my name. Indeed. We got in line, and learned that, unlike most of the other celebrities, Wil did not charge for autographs and photos. Nice. The program had led us to believe that it would be something like $70. While in line, there were a trio of guys behind us who were wondering who "that redhead over there" was. Seriously: they didn't know who Felicia Day was! Apparently, they hadn't seen anything of Wil Wheaton since his role in Stand By Me, the DVD case of which they had brought for him to sign. "What else has he been in?" they asked. We blinked. We then patiently explained to them about The Guild, and also threw in a little bit about his appearances in The Big Bang Theory. Oh, yeah, and Star Trek: The Next Generation. A couple of groups in front of us were a trio of female superheroes. One of whom, dressed as Wonder Woman, held a crocheted doll that reminded me of a Little Big Planet character. I asked her what it was, and she showed it to me. She had made Wil Wheaton a doll of his character Fawkes from The Guild, complete with kilt and Axis of Anarchy shirt. It was adorable; it was incredible. She was a bit self-conscious about the hair. I told her it was awesome, and he would love it. He totally did. I'm pretty sure it made his day. "Where did you get my shirt?" he exclaimed. I replied that I had made it, and that it was superior to his because it glowed in the dark. He retorted that HIS was superior in that he had worn it. I conceded, but pointed out that that could be fixed. I asked him, however, if there was a pen appropriate to sign the shirt, which there was. I took it off (I was wearing a shirt underneath), and he autographed it, signing each of the shirts in the recursion. Wil Wheaton demonstrates the signed shirt. We asked Wil what he thought I should do when people confused me for him. He said I ought to play along with it, and keep making things up that were so wild and crazy that eventually they would figure out I wasn't the real him. Everyone was all for it, except of course, that I'm a terrible liar. After that, Liz and I got a quick picture with him (which was on Andrew's camera, so I don't have access to it yet), and we were off. Andrew wanted to catch the end of Jonathan Frakes' panel, so we headed back to the hall. While he met up with his girlfriend, Elizabeth, Josh and I sat in the back to watch. When it was over, we were mulling around what to do next, and how long to stay, when a short and petite woman asked me whether I remembered a charity race from a few years back. "Not really," I said, "I'm not Wil Wheaton." She was taken aback for a moment, but then exclaimed at how much I look like him. The shirt doesn't help matters, I conceded. She wanted to take a picture with me, so I obliged. I offered to kneel down to be closer to her height, but she said that she hated when people did that. As the photo was being taken, another girl walked up and started taking my picture when she had left. I asked her if she wanted a picture with me instead of just of me, to which she eagerly assented. After that picture, a little kid wanted a photo with me. I didn't have the heart to mislead him, so I told him who I wasn't, but did he still want a picture. He did, and I obliged. As we were finishing, the girl from before came back. She shyly said she was sorry to bother me again, but she had forgotten to ask for my autograph. Flabbergasted, I realized what I had done. Taking pictures was one thing, but I didn't think I could forge his autograph in good conscience (or very well, without practice, and my only reference on my own chest upside-down in dim lighting).